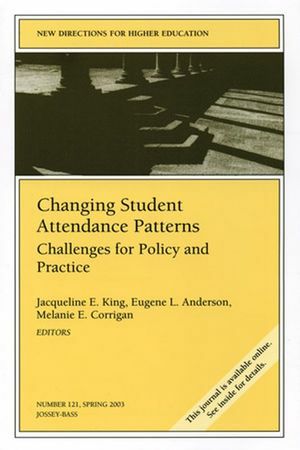 With data illustrating emerging attendance trends in student college attendance patterns, this volume provides concise analysis and perspectives from experts in the field on how policymakers and institutions can accommodate student choices, maintain academic integrity, and promote student success. JACQUELINE E. KING is director of the Center for Policy Analysis at the American Council on Education. EUGENE L. ANDERSON is a research associate in the Center for Policy Analysis and Office of Minorities in Higher Education at the American Council on Education. MELANIE E. CORRIGAN is assistant director of the Center for Policy Analysis at the American Council on Education. EDITORS’ NOTES (Jacqueline E. King, Eugene L. Anderson, Melanie E. Corrigan). 1. Changing U.S. Demographics and American Higher Education (Eugene L. Anderson). As America changes, so does demand for higher education. Ethnic diversity and the “Baby Boom Echo” generation’s entry into college are among the trends that will change student profiles. 2. Swirling and Double-Dipping: New Patterns of Student Attendance and Their Implications for Higher Education (Alexander C. McCormick). Attendance at multiple institutions is increasingly common and involves a number of patterns beside transfers between institutions. 3. Beyond Access: Persistence Challenges and the Diversity of Low-Income Students (Melanie E. Corrigan). Low-income students enter higher education with family obligations and goals that often vary from those of their younger and traditional counterparts and that make persistence much more challenging. 4. New Modes of Productivity for Student Learning (Barbara E. Walvoord). To make productivity strategies work, an institution needs to put in place a program of five components: learning goals, measures of student performance, knowledge of how to achieve learning with the particular student population, knowledge of options for increasing productivity, and institution-wide support. 5. Public Policy Implications of Changing Student Attendance Patterns (David A. Longanecker, Cheryl D. Blanco). Public policy can respond to changing student attendance patterns in four ways: funding programs, contracting with private entities to provide services, creating incentives for private action, and mandating action through law or regulations. 6. Nontraditional Attendance and Persistence: The Cost of Students’ Choices (Jacqueline E. King). Working more than part-time and attending college part-time negatively affect persistence—especially for low-income students. These student choices also impede the ability of institutions to shorten time-to-degree, improve graduation rates, and accommodate larger numbers of students. 7. Rethinking Policy, Process, and Planning to Redefine Quality and Enhance Student Success (Joanne Passaro, Lucie Lapovsky, Louise H. Feroe, James R. Metzger). Combining broad access with academic excellence requires a carefully articulated set of academic and support strategies and practices that can pinpoint student needs and target appropriate resources. 8. Best Practices in Providing Nontraditional Students with Both Academic and Financial Support (Natala K. Hart). Reducing the time that students must spend in the financial aid office and integrating financial and academic advising are especially helpful to nontraditional students.